Aurender S5W review | What Hi-Fi? In hi-fi circles, wireless has never truly meant wireless. There’s always some form of physical cable that needs to be used, especially when it comes to premium stereo speakers. The Aurender S5W speakers hope to change that. Previously, even those speakers that actively promote the concept – the excellent KEF LS50 Wireless (£1,999) or Dali’s Callisto 6 Cs (£3,199) – still need mains cables to each speaker, and in the KEF’s case, a link between the two channels to help synchronise things. Aurender’s imaginatively titled S5Ws are different, being battery powered and devoid of physical inputs beyond the dedicated wireless connection. If you really want wireless stereo sound, you can’t get more untethered than this. If the thought of relying on battery power in a premium speaker worries you, we can sympathise. The idea of having to recharge the speakers midway through a listening session doesn’t appeal to us either, but Aurender has taken a sensible and practical approach. The company also provides a mains power option in the box, but using the S5Ws this way would go against their raison d’être. Rather than develop its own batteries, which would have been an expensive and time consuming approach, the company has decided to use the 18v Lithium Ion battery power packs as used on Bosch cordless power tools. Two of these 18v 6Ah batteries and a charger are included in the £2700 price we’ve quoted, though if you want to buy the speakers without the battery pack it will cost £200 less. The batteries take 30mins to reach full charge and once there you should have around 50 hours of music, depending on volume levels and type of music played. Aurender claims 30 days of standby time, so as far as battery operated products go the S5Ws should be as painless as they come. These batteries are freely available, so it makes sense to buy another pair and keep them fully charged, ready to replace depleted packs when required. It only takes a matter of seconds to swap. The S5Ws have two built-in 50W amplifiers per channel, each dedicated to a single drive unit. It comes as no surprise to find that the amplifiers are Class D designs; such circuits make total sense when low power consumption, minimal heat output and small size are priorities, as they would be in any portable battery powered product. Aurender buys in its drive units, as most small manufacturers do. The tweeter is a 25mm soft textile dome from Danish OEM specialist Scan-Speak, while the small 11.5cm mid/bass comes from Norway’s SEAS. The mid/bass cone is coated with Nextel to help with resonance control, and its motor system is optimised to reduce distortion and improve power handling. There’s a rear-firing reflex port to augment the mid/bass driver’s low frequency output. The S5W’s crossover point is positioned at 2kHz and Aurender claims a fairly conventional 50Hz-22kHz frequency response (within -6dB limits). That low frequency reach is pretty impressive considering the small mid/bass driver and compact 22cm tall enclosure. As far as inputs go there’s only one. It’s a dedicated uncompressed 16-bit/44.1kHz wireless link with a range of up to around 20m. This takes the form of a USB dongle that can be plugged into your computer, phone or tablet and connects to the speakers automatically. If you own an Apple Lightning device you’ll need the USB Camera Adaptor (£29) to connect the Lightning connector on your device to the dongle, while other non-USB phones and laptops, will also need an adapter. It all works seamlessly once you have all the bits with the connection being made without fuss. Take the S5Ws out of their packaging and it’s surprising just how small they are. Their footprint is barely bigger than that of a typical paperback. The next surprise is how much they weigh. At 5.2kg they’re pretty hefty for their size and much of that is down to the immaculately constructed aluminium cabinet. It feels immensely solid and is beautifully executed – edges are crisp and the fit is lovely. The use of Class D amplification means that it doesn’t warm-up much either. There are three finish options: red, black and dark blue. Around the back, you’ll find the socket for the detachable aerial beside buttons for power, bass and treble. After playing around with the tone settings we choose to leave them off, as the standard level sounds most balanced to us, regardless of the speaker position chosen. The Aurender S5W's lack of wires (as well as their small size) means that they can go just about anywhere. 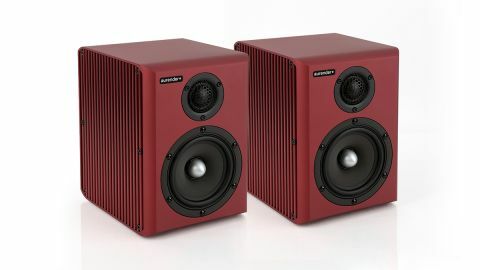 While they undoubtedly sound best on a solid pair of stands, a little way away from the rear wall – around 30cm works best in our test room – they still produce fine sounds in all sorts of places from a window sill and desktop all the way through to bookshelves or on a table next to a TV. Simply plonk them down where you want and enjoy. It’s as simple as that. We want to extract the very best from them, so we do all the hi-fi set-up things for serious listening, but the point is you don’t have to and they will still entertain. Once we start auditioning, the S5W’s expertly judged tonal balance shines. Speakers this small can easily sound undernourished but these Aurenders deliver a full-bodied and solid presentation that belies their diminutive dimensions. Lows are pleasingly solid and weighty, delivering the challenging pulsating low-end of Neneh Cherry’s Spit Three Times with determination and punch. The Aurenders convey the track’s momentum well, and manage to tie together the various instrumental strands in an admirably cohesive way. These speakers dig up a good amount of detail, but it’s their ability to organise all this information in a musically entertaining way that really impresses us. There’s enough insight here to analyse a recording if you must, but really, these Aurenders would prefer you just to sit back and enjoy. They have a lovely, well-integrated midrange. Voices come through with generous portions of passion and subtlety. This points to well matched drivers and a carefully calibrated crossover network. Similarly, the top end has a good amount of bite, but tempers it with enough refinement to avoid a fuss with aggressive recordings. We try Tchaikovsky’s Romeo And Juliet and are surprised with the S5W’s gusto when dealing with the wide-ranging dynamics and complex score. These speakers can sound surprisingly forceful when required and can render the almost brutish power of an orchestra in full flow well. Stereo imaging is good. The speakers’ soundstage is decently expansive and nicely layered. It stays stable and focused even when the music gets demanding. Image scale on a grand orchestral piece such as this is a little on the small size, and the speakers have a clear upper limit in terms of volume. Beyond a certain point they quickly lose their composure and start to sound thin, hard and confused. That limit is relatively high though, and above what we would consider normal listening levels in a small to medium-sized room. If you have a large listening space or listen to bass heavy material at high levels it’s worth checking out whether these Aurenders are suitable. Though impressively accomplished, the Laws of Physics come into play and limitations imposed by the size of cabinet and mid/bass unit can’t really be avoided. We haven’t come across anything quite like these speakers before. Being so small and truly wireless means that they can be used in places and situations where conventional alternatives just wouldn’t get a look in. As such they have an advantage even before their excellent sound and build is taken into account. While we wouldn’t replace our conventional hi-fi system with these, we can think of many circumstances where the Aurender S5Ws would be perfect. That makes them mighty tempting in our view.